Recently the people at Phaidon Publishing asked me to take a look at The German Cookbook… and wow, I’m impressed. Alfons Schubeck’s collection of over 500 authentic German recipes brings together all the different regional dishes in one (heavy) comprehensive book. 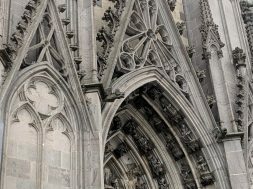 You won’t just find the standard Rouladen, Sauerbraten, Schnitzel Recipes that are on most German menus. I was delighted to find recipes that I’ve only ever seen on my Oma’s table… Broth Soups that start a meal, basic vegetable dishes, and Eintopfe (one pot meals) to feed a hungry family. This encyclopedic collection belongs on the shelves of anyone wanting to dive deep into German Cooking. 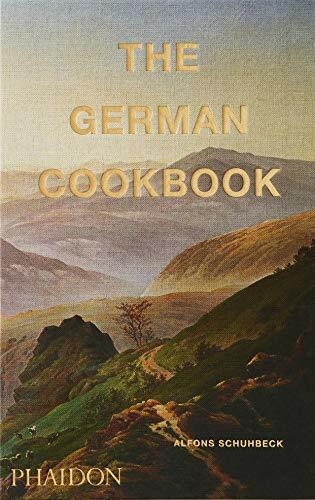 The cover and artwork for The German Cookbook are all by Caspar David Friedrich, a German Romantic Landscape painter, who was considered the most important painter of his time. One of his pieces (well… a copy) hung in Oma’s Dining room, so, to me, it’s perfectly appropriate to see this art associated with food. 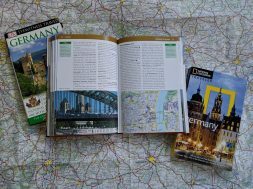 What’s interesting is that the images are of a Germany from days gone by, but the recipes have all been updated and tested for the modern kitchen. The old flavors are present, although some techniques and ingredients have been updated so that they can be reproduced at home. One example is the recipe for Königsberger Klopse (called Königsberg-Style Meatballs with Caper Sauce). As a child, this was one of my favorite dishes from my mother’s kitchen. Flavorful meatballs in a creamy sauce studded with capers (of course, as a child I picked all the capers out…), then served over potatoes (in the book, he suggests rice… that was a non-starter on my father’s table). The recipe in The German Cookbook nails the flavors I remember. (Although, I can say with absolute certainty that my mother would not have paid for ground veal… ours were plain beef). After cooking the dish using the recipe from the book (luckily, our grocery store had veal), I called my mom to ask about her recipe. The only real differences were 1. she uses anchovy paste instead of chopped anchovies (don’t scoff… anchovies in the meatballs are the secret flavor ingredient, and should NEVER be left out) and 2. she chopped up capers to stick in the meatballs, and The German Cookbook just adds them in the sauce (For the record, Dr Oetker’s old recipe uses an egg yolk to thicken the sauce… instead of cream). The result was delicious (although, not super pretty). like mother, like daughter…. only now I eat my capers gladly! Instructions are straightforward, but stripped down a bit. For anyone comfortable in the kitchen, there should be no problem following the instructions to reproduce the dishes with fantastic results. Just be sure to read them through, and have your ingredients set to use as needed! (More than once I’ve been at a critical juncture of a recipe, and have had to dig through the fridge to find the missing ingredient… or worse, head to the store!) And for gosh sakes, have your glasses on hand, because the type used in the book is rather small (obviously, it’s to make them FIT… bigger type would make this book a foot thick!). There are beautiful photos of many of the recipes, but not all of them. And since the recipes are presented without an introduction or explanation, I do wish that every recipe had the German name along with the English name for the dish. Many do (especially the Desserts and Baking Recipes). Still, some of the translations are confusing to someone who is used to hearing the German names for dishes. I’m still not sure what a Dortmund-Style Sandwich is… although the recipe reads like a recipe for Brötchen served with Mett and onions… so, a Mett Brötchen? Alfons Schuhbeck is known for his emphaisis on herbs and spices, and that comes through in the flavors. Don’t skimp! In fact, if you plan to do a lot of German cooking, you might want to stock up on peppercorns, bay leaves, allspice, and nutmeg. And don’t forget to plant parsley in your herb garden… Fresh Parsley comes up a LOT! One thing I noticed, the use of Powdered Sugar in many of the savory sauces. A version of the Pork Medallions with Creamy Mushroom Sauce has long been a staple in our house. I’ve always made it with cream and Dijon mustard to give the sauce a zippy flavor. The German Cookbook recipe adds a spoon of powdered sugar… but also Lemon zest and cumin (an unusual ingredient in old-school German cooking) and it WORKS! This dish has gone from a “mom’s in a hurry, let’s get dinner on the table” meal to a dish worthy of company. The German Cookbook does cover the basic fruit or pudding desserts that showed up on our table as Nachtisch every evening. Something sweet to round out the meal. This didn’t mean a big slab of cake (cake/Kuchen is for afternoon coffee), instead, my mother would often serve a simple compote of whatever fruits were in season. Simple and satisfying. If you are unfamiliar with German pudding, be aware that this smooth treat is not quite as sweet as its American cousin… and it is often served with a sauce or fruit topping. Alfons Schuhbeck was one of the first Michelin starred chefs outside of France. Today, in his 60s, he oversees a food empire in Bavaria, and is as controversial as some of those chefs you see on the American Food Network. But you don’t get a Michelin Star for being boring and mundane. And this book is clearly a summation of his experiences cooking German food. He opens the cookbook with a detailed introduction that explains a bit about the history of German food (honestly, for the longest time, German food was meant as a fuel, and not a pleasure). Chef Schuhbeck also talks about the huge regional differences in German cuisine. As for the recipes, the German Cookbook covers it all… from simple boiled potatoes (there are separate recipes for boiled potatoes, parsley potatoes, potato puree and mashed potato) to the most elaborate Tortes. I was sort of happy to see the recipe for Kohlrabi (my childhood nemsis) alongside recipes for cabbage (both red, green and sweetheart). There is a large chapter on Wild Meats (bringing up memories of spitting shot out of the Rabbit Opa shot and Oma cooked). And lots and lots of soup recipes! The simple pleasure of a broth soup with additions like pancake strips or backerbsen take me back to childhood when a soup would whet our appetite for the meal to come without filling us up completely. The German Coobook by Alfons Schuhbeck is a beautiful cookbook for anyone who wants to go deeper into German Cuisine. It truly covers everything from Soup to Dessert… from North to South. It might also be an interesting coffee table book for anyone who loves to browse through cookbooks for the photos (me). And mostly, flipping through the pages and pages of recipes is a wonderful reminder of the foods that showed up on your Oma’s table. next German Meals at Oma's by Gerhild Fulson- My Favorite German Foods! Schuhbeck is one of the masters of cuisine and famous for having remained on domestic cuisine instead of going exotic as so many others. He always stands for short time and low temperature, thus preserving the vitamins and the nutritive value of the product. A less known aspect ìs his sound knowledge on spices which gives another edge on his superiority!